Standard grips don't work for all golfers. Some benefit from larger grips. Golf clubs come with standard grips, but not all golfers have the same size hands or the same ability to grip the club. 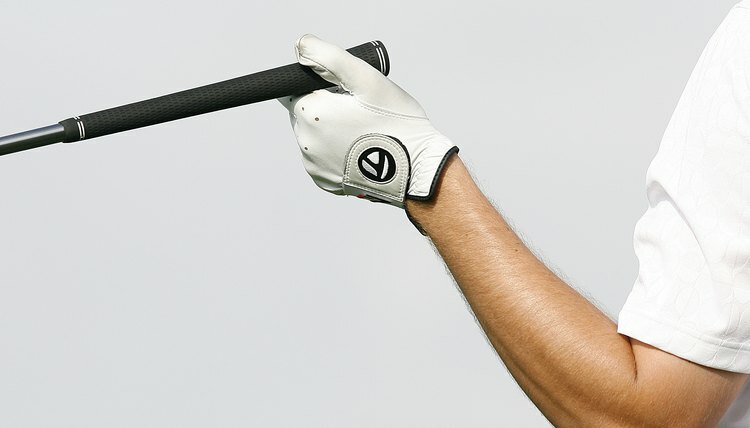 Oversized golf grips offer an alternative to players with large hands or weak grips. According to Golfweek.com, oversized grips are between 1/16 to 1/8 inch larger than standard grips and can feel like the "difference between a pencil and a baseball bat." Most major grip makers offer an oversized grip option, which can easily be installed on any club. Golfers with weak grips, arthritis, joint pain or other conditions that make it hard to grip a golf club can benefit from larger grips. Because the grip is larger, the golfer will get a better feel for the club by using a larger grip. According to GolfGripGuide.com, larger grips will also better absorb the shock of impact or a mis-hit, which means less stress for golfers with weak hands or grips. Using a larger grip will allow some golfers better control of the club, according to Golfweek.com. How a golfer grips the club and how tightly he can hold it determines, in part, the accuracy of a shot. If a golfer is more comfortable with a larger grip, he will have a better chance at hitting the ball squarely at impact. The improved grip should also translate into additional power or distance on the shot. The trajectory, or flight path of the ball, is affected by a player's ability to grip the golf club properly. According to Golfweek.com, golfers who cannot properly hold a standard grip may consistently hit balls that slice (fade right) or hook (fade left) because the club is either incorrectly positioned in the hands or is moving at impact. Using an oversized grip will help eliminate this problem by allowing the golfer to have a firmer grip on the club. Golf Grip Guide: Are There Grips for People Who Suffer from Arthritis or Joint Pain?